To refer specifically to role-playing games. Free-form Role-play is a kind of improvisational acting or story-telling, where the avatars represent characters in-play and the people controlling those avatars are their writers/actors. Free-form means there is no script; scenes evolve out of real-time character interactions. In NeoVictoria, we do free-form roleplay. Here’s the link to our Best Practices. We also use a simple dice-based wearable HUD called the NeoVictoria Roleplay Tool. The item is free and available in the skymall. Here’s the link to our Dice Rules. A masked ball is being held by a mysterious benefactor who now resides within the castle. Everyone within the lands of NeoLondon has been invited to attend this most audacious event! Who will have the nerve to show? Madame Red (Trinity) cast a grin to him as she reached up and readjusted the veil she wore. The dark fabric would cover her monstrous grin as she moved to stand by the chair. “This shall be an interesting night, M’lord.”Lord Coat (TheFireofLife) chuckled deeply, that low voice bellowing. He took her hand in his, and pulled it to his mouth, tracing the sculpted lips over it as if to kiss her. “Be wary, love. I fear there may be those who suspect me to be up to some suspicious act, and may attempt to interfere.” There was as much innocence as there was contempt in his voice. Madame Red (Trinity) giggled, a dark sound coming from the veiled woman. “No harm shall come that is undue, a little extra paperwork never hurt no one.” She placed an affectionate hand on his shoulder as she turned her gaze to the door, expectantly.Lord Coat (TheFireofLife) crossed one leg over the other, and leaned into the cushion of the chair casually, like someone at ease. It was a change from the odd pantomime performance he had given the night before – waltzing about town, doing silly tricks and motions to attract the townspeople to the event. He was rather pleased with himself for the show. He too watched the door. Amelia Elodie Blackrose (ameliablackrose) stood outside the door to the castle, golden eyes locked onto the swirling orbs that seemed dazed by the lantern light. With some hesitance, the vampiress reached for the door, a strange scent distracting her, and warding her away. Or, perhaps it was her imagination. After all, the last time she had visited this castle, she did not leave unmarred. With a faint toss of her indigo locks, she paused thoughtfully. She could afford to be ‘fashionably late’ as the invitation granted allowable. Angelus Nielson simply.. appears in the corner, as if you were looking and your eyes slid right by him. He stands silently, obviously on guard, watching the goings on. Asil Karu has been fussing with the kitchen fae all day and when she comes to it, can’t decide what to wear. In the end, she decides best to keep her costume one that she can easily move in. She straps a blade to her thigh …hoping to hide it under the skirting. Madame Red (Trinity) glanced around the room as she waited. Her becoming slightly nervous as she stood. She spoke softly. “Dear, do you not fear a surge of violence when these …cattle become frightened?” Her eyes trailed the room, looking for places of strategy. Kit walked up towards the castle, having argued with herself all night about going. Last time she was there things had shot at her and a group of people, one of those people called her a name. Why did people act so familiar towards her, she shook her head before glancing up. She paused as she saw another person, sticking close to the left side to move around her. She hummed softly as she walked to the door, tapping softly on the wood. Kit had fussed with what to wear and finally managed to find a suitable dress. Myomy Ohmai (myomy) fluffs her petticoats and smooths her dress over them. She looks in the mirror one last time. Is perhaps the costume too ornate, she asks herself, yet again? Should she change, yet again? “Humph,” she says aloud, imitating her father when invited to dine with royalty. “Whether it be in Paris or in Borneo, it is what’s inside that people want to meet. Not what’s outside,” he would say to her. With a final toss of her feathered head, Myomy walks out the door. Amelia Elodie Blackrose (ameliablackrose) looked up to the somewhat – but not entirely – familiar woman, golden eyes observing her motion and form in silence. Her deep ruby stained lips curled into a polite smile as she nodded a greeting to the other. “I suspect we may be the first to arrive, mon cher.” The woman’s accent was sweet as she slowly paced towards the other, the folds of her gown barely hiding the glide of her hips. Angelus Nielson watches Myo leave, the mask turning with almost mechanical perversion, as if on a swivel. Kit looked back at the woman and nods, resisting the urge to play with her necklace. ” I think so as well, should we just go in?” she asked her softly. She didn’t know if that was proper for a party or not. ” Perhaps it would be alright instead of waiting out here” she muttered the last part and knocked louder. Asil Karu climbs down from the loft and out of the barn, heading toward the castle. Amelia Elodie Blackrose (ameliablackrose) looked to the woman, and slowly shook her head. “Where I am from, party informality are considered so posh, there is hardly any observable decorum.” A faint sigh escaped Amelia’s lips, as she felt almost nostalgic for her younger days of wild Parisian galas. When she caught the sound of a voice, she gently pushed one of the double doors open, and glided into the ballroom. Madame Red (Trinity) grinned beneath her veil as her gaze flicked to the door. Her form erected, straightening. Madame Red held herself with a grace usually reserved for those of royal birth, her hand remained on her loves shoulder. She said nothing as she merely observed. Myomy Ohmai (myomy): “Ready is a relative term in this case, but I will say yes. And you? Ready? 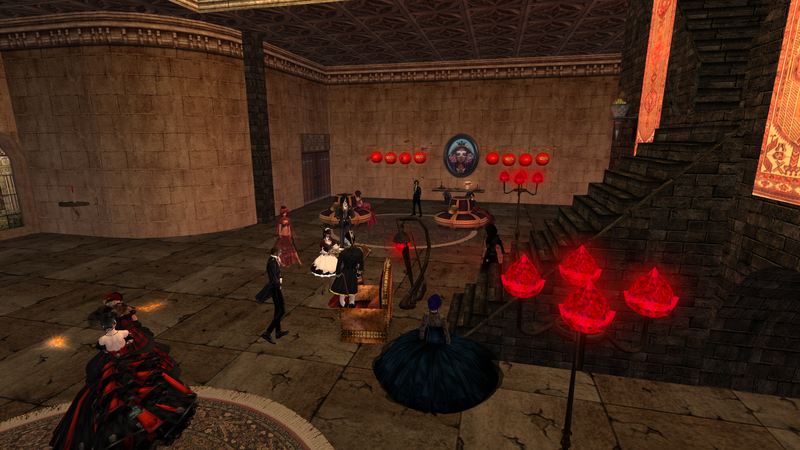 Anya Greer (xiuhcohtl.balazic) stood in one of the side rooms, listening to the main room of the castle fill with music. Soon, she would be able to make her move when the guests arrived. Mia Pleides slipped on her mask and took one more look in the dresser mirror. This costume will have to do though it is more elaborate than she was accustomed to wearing. Somehow it seemed that there were some additional things in her trunk as she unpacked at the Tavern today. “Hmmmm”,she mused, Perhaps these things were already in the trunk before I packed. Well they are lovely and suitable for this event.” Mia took the derringer from it’s holster and put it in her small evening bag. “Just in case”, she thought.. The invitation to this ball was too intriguing to ignore though it had been delivered in a most strange and perhaps even sinister method. How could the personalized invitation have been waiting for her at the Tarot table when she had told no one but Myomy and Asil that she was moving here today? It was most unusual and the timing uncanny.. Mia looked at the watch on the dresser . “Oh! I don’t want to be more than fashionably late. I will have to hurry now.” She descended the stairs of the Tavern, enjoying the swish of silk as her skirt swayed . Stopped at the bar and helped herself to a tiny bit of Asil’s fine brandy, leaving the appropriate coins on the bar. ” a wee stiffener”, she thought, “just to take the edge off my nerves”. As Mia headed toward the castle, the evening air felt cool and refreshing. Asil Karu: “I am always ready for an adventure!” Asil’s eyes sparkle above the veiling. “Shall we enter?” She starts up the stairs. Kit (kitiarafox) was about to head in when another voice greeted her. She turned towards the voice and bows her head in greeting. ” I suppose so, as ready as I will ever be. Shall we?” she asked beore opening the door and heading in. Myomy Ohmai (myomy): I’ll follow you. Lord Coat (TheFireofLife) muttered lowly to his female companion. “It’s show time, lover.” His hand squeezed hers for a long moment as he rose to greet his guests. “Good evening… good evening.. Welcome citizens of NeoLondon.. I have been in such great need of meeting you all!” His deep voice, though intimidating, did seem cheery. Asil Karu watches the gate open as they approach, next the heavy oaken doors. The main floor has been transformed! There are banners everywhere, ruby-colored lights and sitting in a seat that looks almost like a throne, sits the mask’d gentlemen from yesterday. Myomy Ohmai (myomy): Walking through the doors, Myomy took in the rich tapestries, flickering lanterns, and graceful music. Such a far cry from the dingy, undressed stones of a few days before. Angelus Nielson squiggles his head in precise increments, taking in everything going on in a clock-like manner. Each pass seems to tick off the seconds as that porcelain face watches the goings on. Amelia Elodie Blackrose (ameliablackrose) moved into the room, a hand straightening a crumpled section of fabric on her gown self-consciously. Despite her mask, the noblewoman had no doubt her indigo hair would reveal who she was to those who were familiar with her. But, she became completely taken aback, as her eyes wondered around the room. The warm glow of the lights, and obviously careful cleaning, made this place appear far more welcoming. And the terrible screech of the monsters beneath the castle? Completely vanished. Jhaesoph Foxdale rummaged through his wardrobe, looking for that rarely worn tuxedo. Surely that would do for the masquerade. He changed into it, sliding his pistol into his vest pocket and leaving the holster behind. No sense causing alarm, but no sense going unprepared, either. He noticed how late he was, and hurried out the door. Kit (kitiarafox) adjusted the mask just for the sake of fidgeting with something as her blue eyes looked around the room. it looked less scary and more… lived in now. She hoped whatever had been shooting at people was gone now. Her eyes flickered back to the hosts, listening to their greeting before doing a clumsy curtsy back. Her eyes drifted around the room other guests, all the masked faces. ” Good evening” she said in her soft voice. music and the sounds of conversation drew her up the staircase. She entered the room, looking to see if any one’s identity was as yet unmasked. Lord Coat (TheFireofLife) gestured with his hands to the inside of the castle. “Please, please, do come in! There are delightful deserts and drinks for all to indulge on, and music to dance to! Welcome to my home!” He continued to sound cheery as he beckoned everyone to come nearer. He was dressed as an admiral of sorts, complete with powdered wig and sword. Anya Greer (xiuhcohtl.balazic) moves to the open stone doorway and peers just slightly around the corner. She looked at the group and smiled, knowing soon she’d be able to blend in. Asil Karu: Turning toward Kit, “Good evening!” Asil does not recognize the woman. She smiles at the others and makes her way toward the male, giving a low curtsey, “Lord Coat. Thank you for the invitation to your new home. Have you taken up Lord Bowley’s station as the new Royal Watcher or are you just visiting?” She would ask this in the gentlest tones, not wanting to offend if he was indeed the new governor of the planet. Myomy Ohmai (myomy) follows Asil, pausing to hear what answer the Lord will give before she introduces herself. Amelia Elodie Blackrose (ameliablackrose) looks around to the other women, and bows her head politely. The vampiress seemed distracted by the goings on. Something stirred in her, telling her she should have come behind a different sort of mask this evening.. Kit (kitiarafox) lowered her gaze as she stepped closer to the center of the room. She stayed quiet as she observed the room, eying everyone’s attire for the ball. She went over her greeting in her mind. trying to settle the nervousness. Angelus Nielson feels his gaze linger on Kit the porcelain somehow radiating interest despite being simply still. Jhaesoph Foxdale entered the main hall, surprised to see how much livelier the place had gotten. As he looked around, he noticed that few had worn full masks. At least he’d gotten that right. He wondered how late he really was. Madame Red (Trinity) conducted herself as though she was mistress of the castle, with poise and understated grace. Her eyes communicated warmth even though it was impossible to tell if she smiled. Her hands were clasped before her stomach as she listened to the mandatory introductions. Her preparing to introduce herself if asked, her getting the facts straight in her head and schooling her expressions. Clyde du Plotte (clyde.gemini) entered the hall and scanned the room. He saw some that might be familiar and smiled despite himself, “An impressive gathering” he thought, “Perfect start to a captive audience” Clyde tried to shake his paranoia unsuccessfully and stepped further into the room. Angelus Nielson swivels his head to look at Clyde and nods as if his entrance was totally expected. Lord Coat (TheFireofLife) could have hissed with delight as he looked to all the guests, stepping forward for just a moment. He paused and leaned against his lover, the woman in red, as if he was not exactly in a well enough state to dance. “I’m merely passing through, though, I suspect I will be visiting often. I much like it here.” He grinned behind his mask, and moved back to his seat, gesturing towards the empty seat beside him. Angelus Nielson moves through the room though his method of movement is weird. It seems that he’s in one place and if you look down or away he has moved. but he never seems to be in motion. He smiles to Clyde, though how a porcelain mask can smile is questionable.. and he lifts a single finger to the white lips. to sit, though she is not sure if he means her or the haughty woman wearing red. Asil has heard her voice earlier, though she had not marked what was said. “I have never seen the castle look so welcoming, even the guardians are silent …and that’s rare and welcome. Thank you again for the invitation.” She curtseys again and moves back from him, to allow others to make their greetings. Clyde du Plotte (clyde.gemini) watched the man come towards him,” Maybe this was the host here to met his guest? Clyde watched the man put a finger to his masked lips and wondered the cause of such a gesture. He remain quiet and wary. Angelus Nielson smiles and goes back to watching the goings on, only close to Clyde. His cane tapes gently on the ground and he seems.. contented, eager, but slightly on edge as if he was waiting for someone or something to arrive. Amelia Elodie Blackrose (ameliablackrose) paced in the apparent line that had started to form to the strange masked lord, and her arms rested at her sides, roses wrapped about her wrists rustling against the fabric. She turned to glance between the figured present – there were familiar scents, mostly, but one especially caught her interests. Clyde du Plotte (clyde.gemini) silently watched the caned man. He thought it strange that he was singled out by the man only to be stood next too. Silently Angelus Nielson: *tips his hat and then holds his hand just above his ascot. He shakes is head and then shrugs slight. The mask seems to send out sheepishness… like he would say more if he could. Kit (kitiarafox) watched the others greeting the hosts, she supposed she should do so as well. But what do I say she wondered as she did her best lady like walk towards the throne like chairs. ” Good evening, thank you for opening your lovely home. I must agree you have done wonders to make it so warm and cheerful” she said softly, doing another slightly clumsy curtsy before backing up a bit. Clyde du Plotte (clyde.gemini) returned his hand and shook looking into the center of the room trying to figure where this *Lord Coat* was…. them in a while, and enjoys trying to figure out the disguises. It is a lovely ballroom. She turns her gaze to the host. He is not familiar to her, and yet… she suddenly feels a shiver run down her spine. Perhaps she should look for the food. As she continues to scan the room, she wonders how it is she came to be invited to this event and is thinks on how little she really knows of the ways of these people. Is there something she ought to be doing? Jhaesoph Foxdale stands quietly, listening to the energies swirling about the place. They were different than before. Curious, he’d have to keep on guard. she viewed her with question. She was not positive of whether he was acting or not. She quickly joined him, her perching in the chair beside him. Her hand resting on the chair besides hers. Her looking to him on occasion from the corner of her eyes. However, her warm and welcoming gaze didn’t falter. She called out. “I encourage you all to sample the foods and drinks set out, superbly prepared.” She nodded her head some. Clyde du Plotte (clyde.gemini) sighed heavily stifling a yawn. He looked around looking for a waiter to hit him up with some hooch! Lord Coat (TheFireofLife) merely inclined his head to each who introduced themselves or greeted the lord, resting comfortably in the large chair as he watched the crowd. So few men in this town, or none who were interested in balls? “Yes, please do!” Eyes watched the two strange men interact for a long moment, then he turned his attention back to the others. Angelus Nielson points with his cane to where the alcohol is set out. he nods his head and the mask seems to grin. He moves in his spectral way to where the table is and takes a glass.. though the astute might notice it just seems to disappear over the course of the next few minutes as opposed to being actively drunk. the stairwell and to the side where the drinks and treats were laid out. She scooped up a tray and moved towards the group. The female was dressed as a maid, deep hair messily wrapped into two buns atop her head, a mask covering part of her face. She moved towards the group, not getting too close to the lord. Asil Karu scans the room and sees the flickering modes moving in circles, she holds her hand up toward one and as it flies close to her outstretched fingers she feels heat coming from it. “A fire spirit?” she whispers as her hand comes safely back down. Myomy Ohmai (myomy): Myomy studies the room and costumed guests, choosing in her head the words that might go in the newspaper. Most were recognizable by hair or stance or voice. The bright-haired one in the harlequin lozenges must be Kit, although, as she saw the other night, there was something amiss in her posture. behind her ear and backed away. She sought out the refreshments and got herself a drink. She flickered her gaze around the room again and smiled, this wasn’t so bad. Kit stretched her arm back to scratch her shoulder blades, the area had been bothering her again. She kept getting flashes in her mind of something red. ” Nice party” she said softly, trying to start a conversation. Persephone (faerewolf) wonders why everyone seems so nervous and why no one is dancing. She finally spies the food and moves towards it, still searching for a familiar face – though she supposes that is to be expected. Reaching the table, she observes the lights with the fireflies, “absolutely charming,” she mutters and she pauses to admire them further while drinking from her goblet. She chokes a bit as she overhears the Blackrose woman seem to challenge the host. Madame Red (Trinity) smiled at the woman in the lovely skirt approached. She perked at the hint of accent. She spoke clearly, her chin raised as she spoke. “Ah, a frenchwoman. Noblesse, je suppose? Je peux dire par la façon dont vous vous tenez, il est dans votre chemin même de la parole. Il a été aussi très longtemps que je n’ai visité la France. Peut-être que vous voulez bien me dire comment il est?” The lady in red offered a comforting smile, even though the smile was hidden. Clyde du Plotte (clyde.gemini) looked over to the gentleman and nodded. as he walked towards the center of the room. Angelus Nielson turns his gaze back to the assembled crowd. He reaches into his pocket, pulls out a watch and checks the time. He winds the watch and then puts it back into a pocket A nod and sme of the wine from his glass disappears. had hired help, but.. that was not whom he had hired. The lord shifted almost uncomfortably, and reached over to take Madam Red’s hand. Asil Karu watches one of the male figures walk toward Lord Coat and what she images is his consort, given the lady was not being introduced. From the walk, she suspects it’s the Bishop. She listens to the woman speak in a language she doesn’t know and shrugs, surprised she doesn’t use the common tongue. Spying the serving wench, she crosses to her to see what is being offered. Persephone (faerewolf) feels a conflict coming and thinks she will excuse herself to look around for a while. tray of goods upright despite how heavy it appeared to be. Her long legs peeked out from beneath the skirt, a hint of something sharp and dangerous lingering there – to any who would dare to look. Myomy Ohmai (myomy): And there! Oh look! It was the Bishop! No one could mistake his mannerisms, half haughty boredom and half frenetic. Myomy was surprised to realize she was glad to to know he survived the last monster’s attack. Kit (kitiarafox) blinked as the two women spoke in a language she dint understand. Still the words sounded elegant and pretty to the ear. Kit took a sip of the drink as she stood back, not very good at parties. She took a deep breath before approaching a woman near by. Like her own dress the woman was dressed in black and red, though her red was lighter in shade than Kits. “h-ello, pretty place hu?” she muttered softly. curiosity got the best of him, deciding to get something from it. Asil Karu takes a small cake from the tray, trying to catch the gaze of the one holding it. If her eyes haven‘t mistaken it, she is concealing weapons as well. “Thank you, Miss. These look lovely.” She bites into the small cake, careful to hold it under her veil. She hears the red woman speak in the common tongue, calling the maid to her and she frowns a little beneath the mask. to examine the red crystal-seeming lights. doll man had said that name to right after she came to the land. Jhaesoph Foxdale takes a pear from the table and moves away from it, to better hear the conversations. Madame Red (Trinity) offered a smile to the maid as she remained cordial and kind. “Those are quite lovely shoes you’re wearing.” The woman remarked, her studying the woman’s face before her brow furrowed as she spoke. “Your mask is impeccably made but I must inquire about your identity. For I cannot remember hiring you, but perhaps you were already hired. You may whisper your name to me.” She nodded her head after giving a comforting squeeze to her loves hand. Delita: appears from under the archway next to the stairs in a puff of black mist. He steps out and glances around the area, seeing who has still remained at the party so far. Copyright 2012 Fun & Profits, LLC; all rights reserved.